cover design © 2010 Kurt Ozinga. Do you love reading? Do you enjoy talking about books with friends? Why not start a book club--YOUR own book club, and turn it into a SPECTACULAR event? Book clubs aren't only for adults. Many kids like you would love to start a book club but don't know how. In this book, I will teach you all you need to know to become a FABULOUS book club hostess. In some cases, you'll need an adult to help you. If that happens, make your parent, guardian or teacher read this book! Starting your own book club can be easy, exciting and fun. The main requirements? A little imagination and a passion for words! Book clubs come in all colors, shapes and sizes. The first step to starting a book club is deciding which type of club you want. So take out pen and paper, and let's start planning! If you have a best friend who is also interested in starting a book club, you can exchange ideas and plan together. You could also plan with a group of friends. Let's Talk About the Book! How to Turn Your Book Club into a Spectacular Event Copyright © 2010. Mayra Calvani. All rights reserved by the authors. Please do not copy without permission. Mayra Calvani spends most of her time doing what she loves best: writing fiction and nonfiction for children and adults. Her children's titles include The Magic Violin, the forthcoming The Doll Violinist, and other books as well as the nonfiction middle-grade book, How to Write Great Book Reviews. Mayra is a member of the Society of Children's Book Writers and Illustrators (SCBWI) and blog editor for the Belgian chapter. The Slippery Art of Book Reviewing is an Award-Winning Finalist in the "Business: Writing & Publishing" category of the National Best Books 2008 Awards, sponsored by USA Book News. The Slippery Art of Book Reviewing by Mayra Calvania and Anne K. Edwards (June 2008 release) has been selected by a professor at Loyola College for a course there. The reason we know is because the professor wrote to ask "where are my books? ...the semester begins soon." "This is an ideal book for girls who love to read. They can take their reading to the next level by forming a club designed to discuss what they have read." "How to Turn Your Book Club into a Spectacular Event, by Mayra Calvani, speaks directly to kids who love to read and who want to share their favorite books with friends." "How to Turn Your Book Club into a Spectacular Event is packed with great ideas on making this happen. From ideas of what to call your book club to brainstorming questions to ask, this is a must have book if you're serious about having a successful club." "From beginning to end, How to Turn Your Book Club Into a Spectacular Event is a great guide for those children who want to take the initiative and create a book club. It provides all the information needed, and even a breakdown of book genres, along with examples of books. And, it ends with a list of popular authors who write for young readers, including the title of one of their books... Any book that helps guide children on the reading path, and encourages them to read is a book that should be recommended. 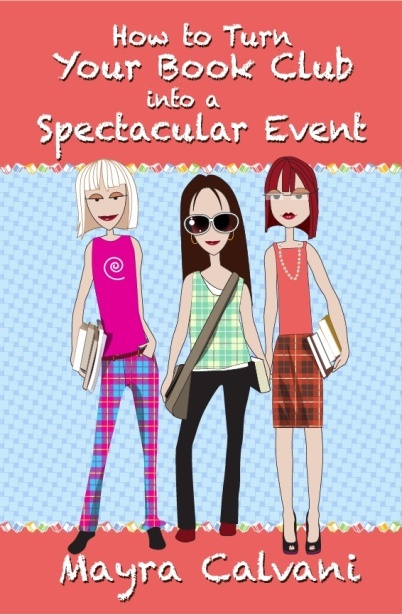 How to Turn Your Book Club Into a Spectacular Event is one such book." Cover design 2010 Kurt Ozinga. All rights reserved. This page last updated 08-10-10.